These state-of-the-art golf instruction training courses provide a focused, step-by-step golf instruction program that will help you improve your golfing ability in the most cost-effective manner. Your Choice: Comprehensive Golf Instruction Program or specific topic instruction courses. Each training course includes a "how-to" e-book golf instruction manual with step by step instruction and vivid graphics, including learning exercises/drills that will help you build your best golf swing and execute accurate and consistent golf shots, AND, a detailed video that demonstrates the learning exercises and techiques that will help you quickly improve. The comprehensive golf instruction course ebook has over 400 pages of graphic instruction and the series of videos provide more than 4 hours of demonstrations that complement and parallel the instruction books. You can start, stop, and restart or repeat your golf instruction any time. Videos are delivered via a 3rd party program (VIMEO) and are accessible for SIX MONTHS so you can complete the instruction course throughout your golf season as needed. The ebooks are delivered directly to your registered email address. The golf instruction courses contain important instructional design elements that help you learn and retain the skills that you develop. The training is designed for both beginner golfers and for more experienced golfers. You can take the training as a complete golf instruction program, using the comprehensive "Playing Golf Instruction Program and Manual"; or take one golf instruction course at a time that has focus on a specific improvement need, e.g., A Basic Golf Swing, or Improve Your Putting, etc. If you would like the instructional ebooks only, without the video instruction and demonstrations please see the ebook page here. See below for a description of each golf instruction course (Link to courses information videos on YouTube here). This golf instruction program is for persons who really want to learn to play golf or improve their golfing skills. It provides a complete and detailed step by step golf instruction training program. It has more than 4 hours of easy to follow video instructions / demonstrations and a 400-plus page student instruction manual / ebook that is included in this training. The instruction program begins with learning about golf, the basic equipment you need, and how to save money before you even start learning to play. It then begins the skill-based instruction with learning how to putt the golf ball. The instruction and learning process is to start short, that is, begin the skills instruction with putting and short shots like the chip shots, before moving up to the longer shots with the longer golf clubs. 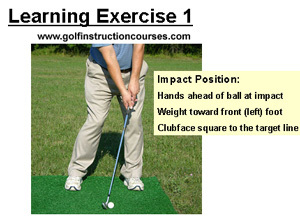 This process allows you to build your golf swing as you move up the golf club and golf shots scale from short to long. Because the instruction video is more than 4 hours it is divided into sections so you are not overwhelmed. It also allows you to move more easily from one skill topic to another. There are many demonstrations and there are learning exercises that you need to complete and practice in order for you to develop the skills that are presented. There is much practice and work for you to do when using this instruction program. Consider the learning exercises and drills your homework! If you follow the instruction in the sequence provided and complete each of the learning exercises and work sheets as described in the training program you will significantly improve your golf skills and playing ability. You will also learn to enjoy practicing and playing golf. Purchase the comprehensive golf instruction courses program, all 11 ebooks and instructional videos, at the vimeo link, above. Each individual (specific skills) golf instruction course is also available at the Vimeo ondemand golf instruction courses page. Everyone who plays golf, or is thinking about playing golf, should take this one golf instruction training course. It will help you get off to a great start. This set of 3 videos, with a student ebook manual, discuss learning and practicing golf and playing on the golf course. It includes discussion on equipment, rules, etiquette, handicaps, difficult courses vs. easy courses, tee time, pace of play, par 3, par 4 and par 5 holes, a playing golf simulation practice process, and much more. The videos are over 1 hour in total length. (Watch Video Info Here). The student ebook manual that parallels the instruction video is included and will be delivered to your registered email address. "Improve Your Putting" discusses and demonstrates how to become very good at putting the golf ball. You will learn about putters, putting methods, accuracy and distance control, and learn specific drills / practice sessions that will help you to consistently make more putts. 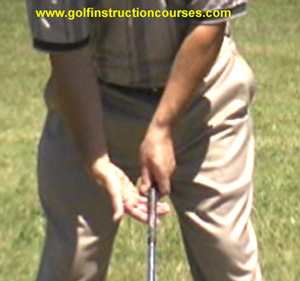 It is the first skills-based instruction course in the Playing Golf Instruction series of training courses. You will be informed as to how to access the video instruction within about 2 days after your purchase. "Set-up and Basic Golf Swing" shows you how to be in position to make a good golf swing that is within your physical capability, and then how to make that golf swing. Thorough discussion and graphics are presented that will help you learn how to take a proper golf grip, establish your alignment, stance, posture and the position of the ball, and how to relieve tension before you begin your swing. A basic golf swing and typical club positions during the swing are demonstrated and the importance of balance, rotation, and control are emphasized. Golf Swing Success shows you how to use the loft of the clubface to properly get the ball up in the air and directly toward your target. No more dribbling the ball down the fairway, or elsewhere! This chip shot instruction course discusses how to improve your chip shot technique and get these shots closer to the cup/hole. Wedge Play discusses the use of wedges, the bounce characteristic of wedges, a process for assuring consistent distance with each of your wedges, and how to get out of sand bunkers using a wedge. Like the chip shot and pitch shot instruction, this golf instruction will help you learn to use your wedges to get close to the cup for a one-putt opportunity. Learning exercise drills are presented that you will need to complete in order to develop your skills. The student ebook that parallels the video is included with the instruction course and will be sent to your registered email address. (Watch Video Info Here). This instruction is for persons who already have a reasonably consistent golf swing, or who have completed all of the golf instruction courses training courses. Increase your iron and DRIVING DISTANCE, ACCURACY, AND CONSISTENCY. PARENTS: This comprehensive golf instruction program provides a great basis for helping your children follow a specific and measurable path toward improvement. GOLF COACHES AND INSTRUCTORS: Contact us to discuss team or group pricing for this overall golf instruction program for each of your students. After you complete these golf instruction courses you will have developed the skills that you need to improve your game and have more fun when you play or practice golf. The result: BETTER GOLF, MORE FUN AND LOWER SCORES! You will improve and have fun while learning! Short Game skills training is provided in the Short Game Set, which includes the chip shot, pitch shot and Wedge Play instruction. The advanced instruction, "Get More Distance" is for students/golfers who have completed the entire golf instruction courses program, or experienced golfers who already have a relatively good and consistent golf swing but need more distance to be more competitive and have more fun. It focuses on swing plane, sweet spot contact, rhythm/tempo, and methods to increase swing speed with applied power. ebooks only: Although I recommend the video and complementing ebook together, some golfers may want only the ebook with no video instruction. See the ebook page or click on the links below to purchase the ebooks by themselves without access to any video. The ebook will be sent to your email address shortly after your purchase is complete. To assure your security we only use secure credit card payment processing through PayPal. We provide instructor-led golf lessons and clinics in southeast Michigan (See Michigan Golf Lessons). The instruction provided in many of the instructor-led golf lesson programs follows the sequence and instruction described in the golf instruction courses e-books. For the experienced golfer we offer swing speed and swing tempo measurement assistance, club selection gap/distance measurement, video analysis, and on-the-course golf playing lessons. For the beginner golfer we offer a non-intimidating learning process that is fun and definitely successful. You will improve very quickly! Contact us to learn about our approach, or to schedule your personal or group lessons. If you have any questions, or for more information, please contact us at training @ golfinstructioncourses.com. Have fun playing Golf - A sport you can enjoy your entire life! SwingRite Golf Swing TrainerSwingRite Golf Swing Trainer helps you learn to sustain the lag, groove your swing, and properly release the club.